The food: Mexican food is such a great guilty pleasure. After all, it’s very often deep fried and loaded with cheese—and when you visit a hole-in-the-wall restaurant (the best kind), it’s likely also swimming in oil, butter, or lard. To save us all a few calories, I came up with this baked chicken quesadilla recipe. Although it has a fair share of cheese, it’s nonetheless a better alternative than what most restaurants dish up. Don’t worry, this is still a damn tasty treat that has a little kick, a little crunch, and plenty of cheesy and creamy goodness. The music: Latin music is an obvious choice for latin food, but that doesn’t necessarily mean mariachi. Santana is great rock-and-roll band and lead guitarist Carlos Santana is a legend on the axe. Truth be told, however, I’ve never been a big fan of Santana, mostly because I never really listened to them. 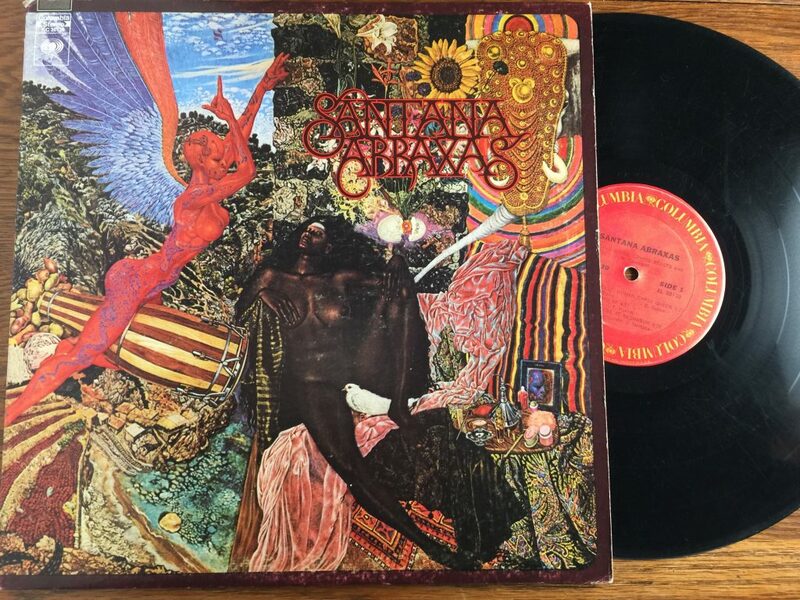 My boyfriend, on the other hand, adores the band and he is the one who picked their second studio album, 1970’s Abraxas, for our Mexican dinner. I recognized several tracks, including “Black Magic Woman,” and found myself dancing around the kitchen as I prepped and cooked. Good stuff. The added benefit of baking, not frying, these quesadillas is that you can cook several at once. If you’re hosting a dinner party, it allows you to quickly serve everyone instead of pan frying one at a time. Cut the finished quesadillas into wedges for easy eating, especially if you plan to serve them as an appetizer to be shared. Want another idea for using shredded chicken? Try my recipe for Slow Cooker Chicken Chili, too. In large skilled, heat oil over medium-high heat. Cook chicken breast until browned and shred using two forks. Add seasoning. Add pepper, onion, and jalapeño. Cook until softened. Add lime juice and cilantro; stir. On greased baking sheets, lay out half of the tortillas. Top the tortillas with half of the cheese. Add the chicken and vegetable mixture and then top with remaining cheese. Place remaining tortillas on top and spray or brush the tops with a light coating of butter. Bake for 10 minutes, carefully flipping after 5 minutes and lightly coating the other side with butter. Serve topped with cilantro garnish and sour cream, if desired. I could go for one of these about right now! Thanks, Sarah. And thanks for hosting the link party! I know what you mean about typical Mexican food being deep fried, as I’m a huge chimi fan. 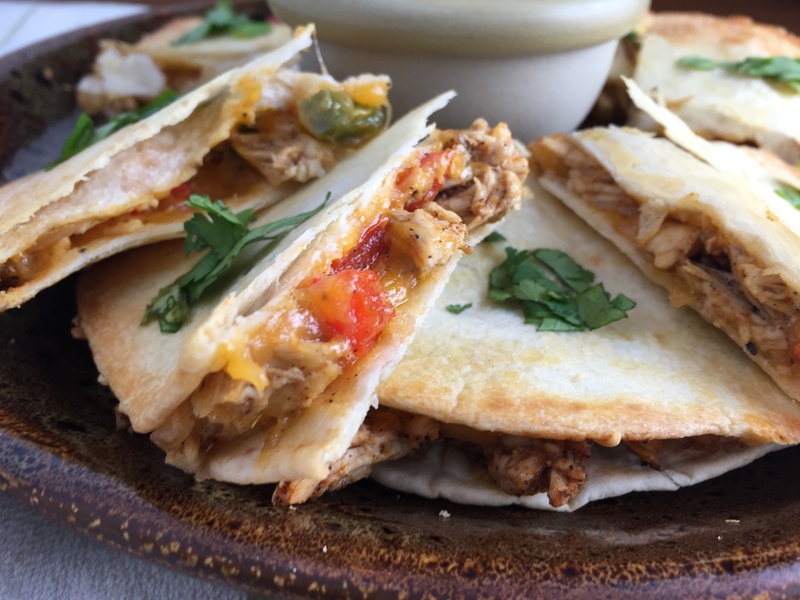 I love the idea of baking the quesadillas and these look so hearty and yummy. I also love how you pair your recipes with music. What a fun idea! These look delicious! Hole in the wall Mexican food is my favorite! YUM! Totally craving quesadillas now. Thank you for visiting me today and leaving a comment…I’m so glad to have found you, especially since I love your food blog/music twist. Thanks, Brandie! Always excited to hear from others who love the music/food combo, too. Come back often! I am pinning this one for sure. I always need Chicken recipes and I don’t know why but I never think of quesadillas. Thanks. I agree hole in the wall mexican restaurants are surely the best! I just love chicken quesadillas. Yum! I think this is something that needs to make it on my plate – and soon! Thanks for linking up at Creative Spark! Baked? Awesomeness! I would love it if you would share this post at our WIW Linky party. I hope you can join us. Hi Becky! OMG your site is awesome! A true gem…I love the music and the food. Connected with you on all major social media sites. My mom and I both share recipes over at LTG…it has become something of a family affair – occasionally you will even see a post by my brother. Have a wonderful day and thanks for reaching out. Love this concept! I always cook with a glass of wine and some great music. 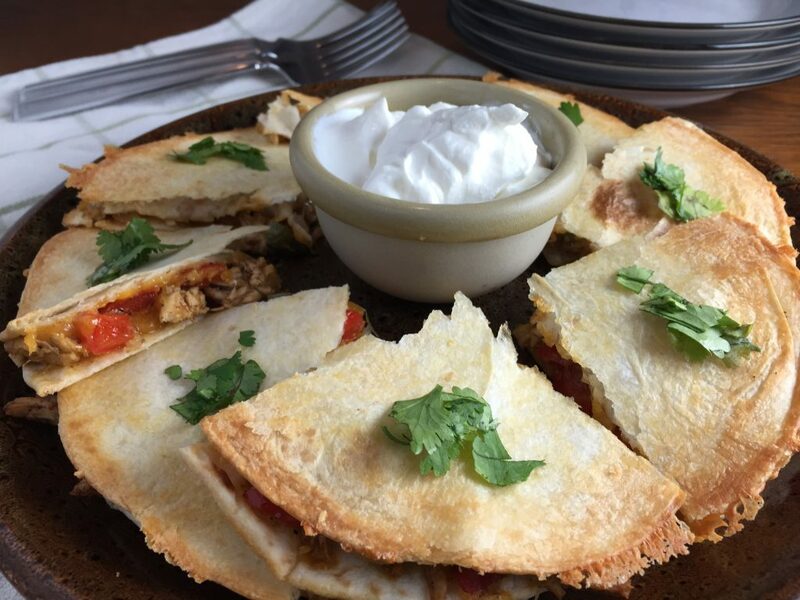 These quesadillas look delicious too.